I live on an avenue and don't really have a patio. We have a porch which I've dressed up before but this year, I think being so into my king's birthday, I just didn't. Kids around here don't trick-or-treat anyway so sometimes I think that's why I don't get into it as much as I used to in our other homes. I think I've mentioned before it's important to know how to use what you've got. 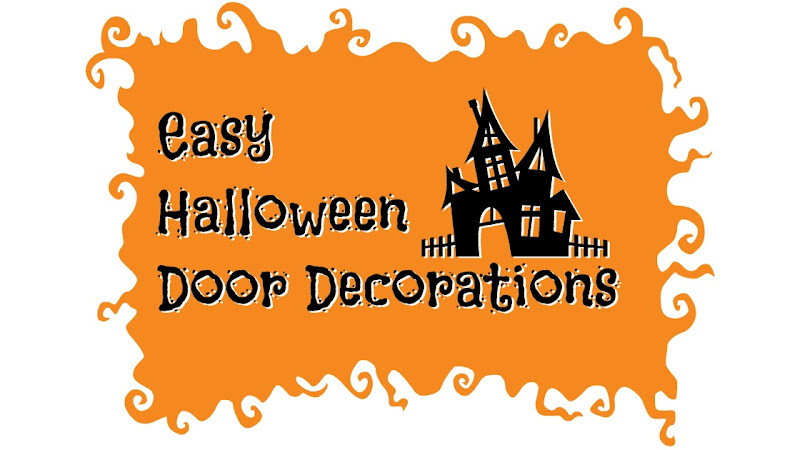 It's why I loved these easy Halloween door decorations. I know people like the traditional wreath with a Halloween twist on it and I do too. I think they're super cute! But last time I decorated I didn't have an extra wreath lying around. I have my Christmas one, which is a tradition to put out and I will not sacrifice, and I have one I decorated for Thanksgiving. Remember, "use what you got" not "go out and buy a wreath". 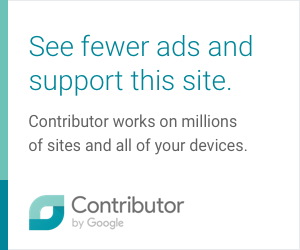 (Unless you want to of course). 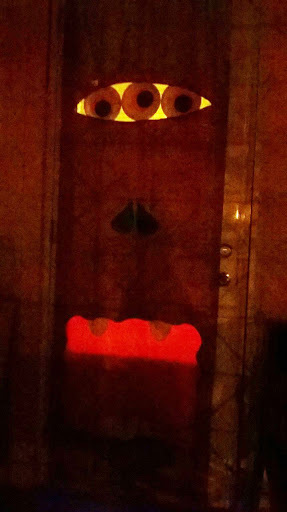 (◠ᴗ◕✿) No wreath meant alternative door decor, which in this case meant...a door monster. Basically you need something to cover your door with (or not), something for eyes, teeth, hair...you can go crazy with this. And the best part is a lot of the things you may have lying around the house. 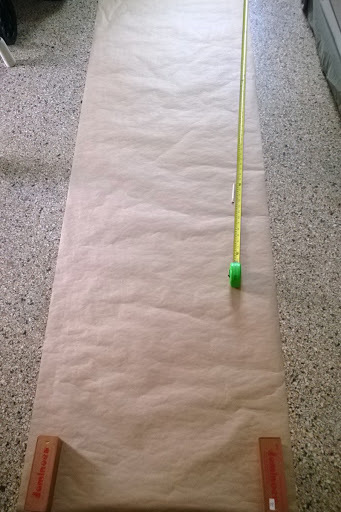 I pulled out one of my kraft paper rolls and marked the measurements of my door (plus about 6 inches on top and on the bottom so that I could fold towards the inside and attach it to the door). I cut out circle shapes for the eyes in two different colors, teardrop shapes for the nose, and gumdrop shapes for the teeth. I used paper plates for the white of the eyes and a folded plastic tablecloth for the inside of the mouth. 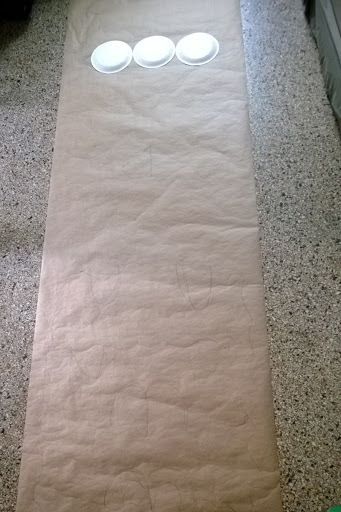 (I did plan to use the tablecloth as a base for our monster, but the door we have has glass. The inside light went right through it and I didn't like the look of it). I also used streamers for the hair. Once everything was placed, my king and I attached everything with tape. Then, it was just a matter of pulling out the ladder to climb up and drape the door monster over the door. 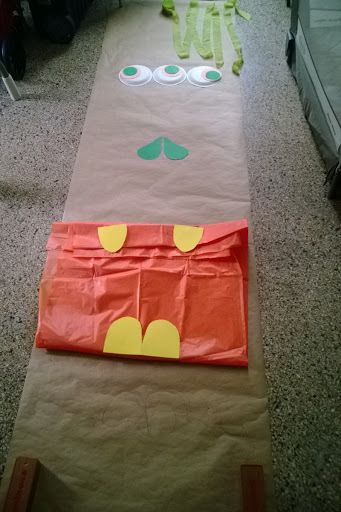 My partner helped with this part so that we could attach the monster to the door. I was on one side holding it up while he was on the other taping it on. I don't know why I didn't take a photo of the monster during the day. I should have done it right there as soon as we put it up, but for some reason it slipped my mind. This photo was taken the night we were going to take it down. I loved when we would get home at night and were welcomed by those eerie eyes. If we're still in this house next year, I would do it again (different face) but shorter so that the monster lies completely on the glass pane and I'd do something else for the bottom non-glass part of the door. 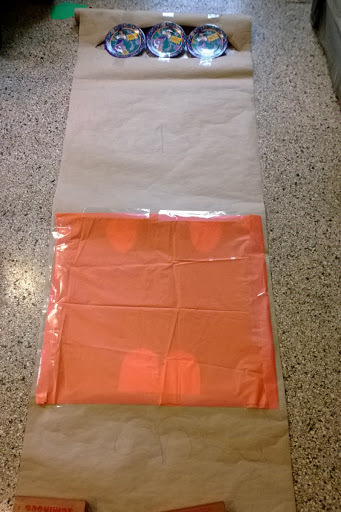 0 comments on "Easy DIY Halloween Door Decoration"